job creation and engagement across cultures in the food sector. Food is a powerful tool for building community. As refugees and migrants re-establish their foundations in a new hometown, they bring with them new products and cuisine, making the food sector an ideal venue to integrate into the Turkish economy and society. By participating in multi-cultural entrepreneurship and workforce development cohorts, and through an event series and the development of a cookbook, LIFE Members connect with their communities across nationalities and share their journeys. The LIFE Project prides itself on its holistic and sustainable approach to building businesses and communities. Entrepreneurs enter a four-month incubation period during which they receive specialized instruction in Turkish or Arabic, plus optional workshops and seminars to build and grow their businesses. As part of their incubation, entrepreneurs team up to host food experiences and dining events as an opportunity to get direct feedback, network and build community. Upon completion of the incubation program, entrepreneurs receive continued support services. We offer skills-matching workshops focused on hygiene, food and workplace safety and customer service to food sector workers and business-owners who want their employees to earn high-demand skills. All LIFE activities take place at the FEC located in the heart of the budding entrepreneurship ecosystem in Istanbul. 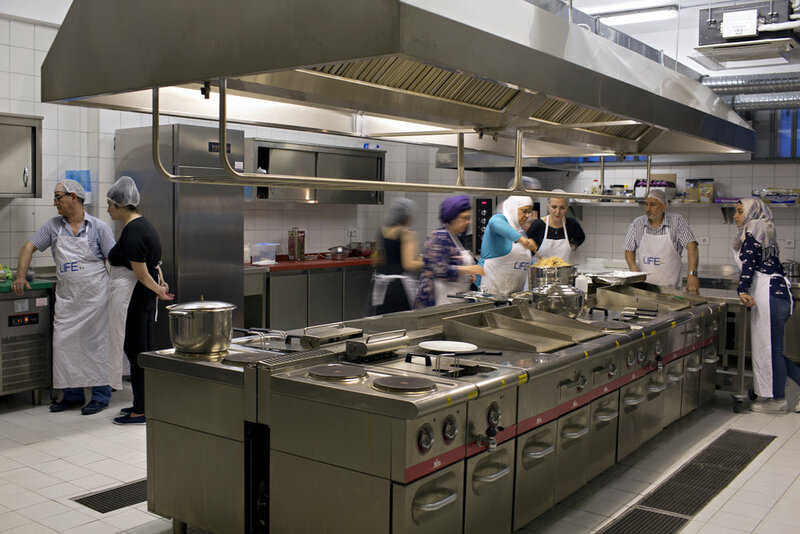 At the FEC, LIFE Members have access to a uniquely designed commercial grade kitchen, co-working space, event space, and on-site childcare. Plans are underway to open a second FEC to support entrepreneurs and food sector workers in southeastern Turkey. The LIFE Project emphasizes social cohesion and gastrodiplomacy, a medium that inspires the people-to-people exchange of culture through food. Opportunities for gastrodiplomacy include shared meals, special workshops and trainings with international chefs and entrepreneurs, participation in food festivals, recipe exchanges, cooking lessons, and much more.